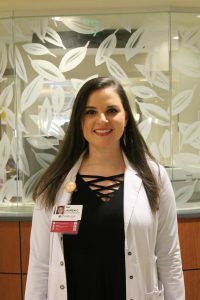 Today we’re getting to know a little more about Lauren Cade, RN. Lauren recently took on a new position at Parkwest as Capacity Supervisor. Why do you love your job? My job is a puzzle that takes several people to solve it. I love watching and helping our hospital staff come together as a team to accommodate our patients. It’s truly amazing the hard work and effort that is given towards each patients admission. What are you thankful for? My amazing family and friends. Where would we find you the day after Thanksgiving – Black Friday shopping or watching football? Black Friday shopping! What is your favorite Thanksgiving dish? Dressing! What do you like to do when you aren’t working? Spend time with my niece and shop!